This protocol describes the preparation of a synthetic tRNA substrate for the Entamoeba histolytica DNA/tRNA methyltransferase 2 (Dnmt2) homolog Ehmeth and the measure of its methyltransferase activity. This experimental approach can be used for investigating the activity of other Dnmt2 proteins. Tovy, A., Hofmann, B., Helm, M., Ankri, S. In vitro tRNA Methylation Assay with the Entamoeba histolytica DNA and tRNA Methyltransferase Dnmt2 (Ehmeth) Enzyme. J. Vis. Exp. (44), e2390, doi:10.3791/2390 (2010). Protozoan parasites are among the most devastating infectious agents of humans responsible for a variety of diseases including amebiasis, which is one of the three most common causes of death from parasitic disease. The agent of amebiasis is the amoeba parasite Entamoeba histolytica that exists under two stages: the infective cyst found in food or water and the invasive trophozoite living in the intestine. The clinical manifestations of amebiasis range from being asymptomatic to colitis, dysentery or liver abscesses. E. histolytica is one of the rare unicellular parasite with 5-methylcytosine (5mC) in its genome. 1, 2 It contains a single DNA methyltransferase, Ehmeth, that belongs to the Dnmt2 family. 2 A role for Dnmt2 in the control of repetitive elements has been established in E. histolytica, 3 Dictyostelium discoideum 4,5 and Drosophila. 6 Our recent work has shown that Ehmeth methylates tRNAAsp, and this finding indicates that this enzyme has a dual DNA/tRNAAsp methyltransferase activity. 7 This observation is in agreement with the dual activity that has been reported for D. discoideum and D. melanogaster. 8 The functional significance of the DNA/tRNA specificity of Dnmt2 enzymes is still unknown. To address this question, a method to determine the tRNA methyltransferase activity of Dnmt2 proteins was established. In this video, we describe a straightforward approach to prepare an adequate tRNA substrate for Dnmt2 and a method to measure its tRNA methyltransferase activity. RNase-free water is used in handling of RNA in the laboratory to reduce the risk of RNA being degraded by RNases. For this purpose, water is usually treated with 0.1% v/v diethylpyrocarbonate (DEPC) for at least 1 hour at 37°C and then autoclaved (at least 15 min) to inactivate traces of DEPC. Pipetman pipettes are cleaned with an RNase decontamination solution (RNase ExTERMINATOR, Biological Industry Beit Haemek) before usage. Eppendorf tubes and tips should be certified free of DNase and RNase to preserve sample integrity. This procedure describes an in vitro run-off transcription which can be used for synthesis of any tRNA. 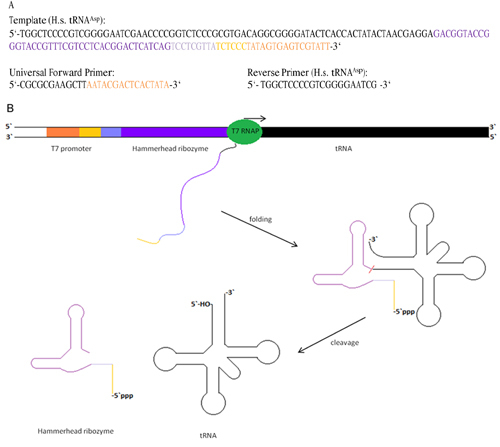 This procedure is an adaptation of the ribozyme method published previously.9 For this purpose a template was designed consisting of the T7 promoter and the complementary sequences of a self-cleaving hammerhead ribozyme and the required tRNA. Transcription of this template results in a product cleaving itself at the 5`-end in a way that the full-length tRNA is obtained with a 5`-OH instead of a phosphorylated 5`-end. The full-length tRNA can be purified from cleaved hammerhead ribozyme and uncleaved products by urea-PAGE. In order to obtain an efficient template for T7 RNA-polymerase mediated in vitro transcription three requirements have to be fulfilled. The T7-promoter sequence (5`-TAATACGACTCACTATA-3`) has to be implicated in the template. To increase transcription efficiency, the first three nucleotides of the transcribed RNA should be guanosine. The correct complementary sequence of the specific tRNA is needed. Since not every tRNA meets the second condition, we herein describe a template additionally carrying a self-cleaving hammerhead ribozyme. 9 The exemplary DNA template sequence depicted in Figure 1 consists of the complementary sequences of Homo sapiens tRNAAsp (black) and hammerhead ribozyme (purple) complementary to the nine 5`-bases of the tRNA (light purple). At the 5`-end the T7-promoter sequence (orange) including a six nucleotide sequence enabling efficient transcription (light orange) is located. After transcription, the hammerhead ribozyme cleaves itself off the transcript leaving the ribozyme and the full-length tRNA (Figure 1B). The latter can be purified by urea-PAGE from ribozyme and uncleaved products. For design of the forward primer, it has to be taken into account that this primer sequence should be extended for at least 5 nucleotides 5` to the promoter sequence to enable binding of the enzyme. Note that these additional nucleotides can be missing at the 3`-end of the template DNA. Here we used a forward primer containing the T7 promoter sequence, ending in the TATA sequence after which transcription commences. This primer is universally applicable for different tRNA templates containing the complementary T7 promoter sequence (both T7 sequences are colored orange in Figure 1A). The reverse primer has a melting temperature similar to the complete forward primer to ensure binding of both primers and efficient amplification. 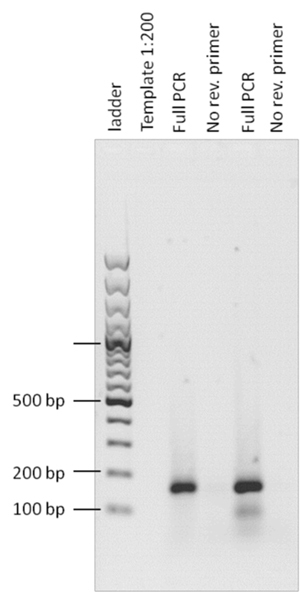 For amplification of template DNA, we used a standard PCR reaction in a final volume of 50 μL. Table 1 details the final concentrations (reaction prepared on ice) and program for the PCR. The low annealing temperature used during the initial 10 cycles accounts for the only partial binding of the forward primer to the DNA template. To reduce unspecific binding the annealing temperature was increased for further 25 amplification cycles. The success of template amplification was tested by a 1.3% agarose gel prestained with 1X GelRed solution (Figure 2). T7 premix can be prepared 5X concentrated (200 mM Tris-HCl, pH 8.1; 30 mM MgCl2, 1 mM Spermidine, 5 mM DTT, 2 μg/mL BSA and 0.01% Triton X-100) and was used for at least one week or five freeze thaw cycles. The transcription mixture has to be prepared at room temperature. Transcription reactions were prepared using 80 μL T7 premix, 80 μL PCR product, 80 μL NTP mix (25 mM) and adjusted to 385 μL with MilliQ water. 15 μL (1.34 mg/mL) T7 RNA Polymerase (final concentration 0.05 μg/μL) are added to start the reaction. The reaction was carried out for 4 h at 37°C. The white precipitate of pyrophosphate indicates successful transcription. Pyrophosphate was spun down for 1 minute at 10,000 rpm. Supernatants were supplied with one volume formamid loading dye and purified on a 12% urea-PAGE using 20 W for 2 hours. Dismount the gel and place it on saran wrap. Stain the gel with 3XGelRed solution supplemented with 0.1 M NaCl for 20 minutes. Upon UV excitation, label the tRNA band on the saran wrap with a permanent marker for later excision. Alternatively, if the expected yield is above 50 μg bands can be seen by UV-shadowing. For UV-shadowing, place the gel on a fluorescent thin-layer chromatography plate and illuminate with a UV-hand-lamp from above. Label bands, which appear as non-fluorescent shadows in the gel (Figure 3), for later excision. tRNA bands were excised with a scalpel and put into 1.5 mL Eppendorf cups. After addition of 450 μL of 0.5M NH4OAc the samples are frozen at -80°C for 2 hours and afterwards incubated at 20°C, shaking with 550 rpm on an Eppendorf Thermoshaker over night. 6. The supernatant NH4OAc solutions from step 5 are filtered with Nanosep tubes (0.45 μm), spinning 90 seconds at 8,500 rpm to remove PAGE debris. Precipitation of eluted tRNAs was performed by adding 2.5 volumes of -80°C pure ethanol (p.a. ), storage at -20°C overnight and 2.5 h centrifugation at 4°C and 15,500 rpm. After removing the supernatant pellets were dried in a SpeedVac and resuspended in MilliQ water. Concentrations were determined using a Nanodrop-ND1000. The yield of one 400 μL transcription was about 80-100 μg. No PCR product. → Is the sequence of primers and template compatible and are all components inside the reaction mixture? No transcription product. → PCR might have been unsuccessful. Correct T7-promoter sequence. Solutions too cold while preparing the reaction. T7 Premix too old. Product on the gel, but no eluted product. → Ethanol for precipitation not cold enough, not pure, not the correct volume. Transformed bacteria were selected on Luria-Bertani (LB) agar ampicillin (100 μg/mL) medium. Four to five colonies were picked up and inoculated into 5 mL of LB media with suitable selective marker (100 μg/mL ampicillin) and incubated overnight in an orbital shaker at 37°C. The culture grown overnight was inoculated into 500 mL of 2X Yeast Extract Tryptone (2XYT) medium with 100 μg/mL ampicillin, and incubated in an orbital shaker at 37°C until the OD600 of the culture reached 0.8. The expression of the Dnmt2 recombinant protein was induced by adding isopropyl-beta-D-thiogalactopyranoside (IPTG) at a final concentration of 0.5 mM to the culture. The culture was further incubated in an orbital shaker for 16 hours at 24°C. The time and temperature of incubation have been optimized to avoid the formation of inclusion bodies. The culture was centrifuged at 4°C, 6,000 rpm, in 200 mL Nalgene tubes for 15 minutes. The supernatant was discarded and the pellet was frozen at -70°C for at least 1 hour. This freezing step improves the lysis of the bacteria. The pellet was harvested in 30 mL of lysis buffer (100 mM KCl, 1mM DTT, 1mM PMSF, 100 μg/mL Lysozyme and Leupeptine 100 μg/mL in phosphate buffer saline (PBS)). From this point, it was crucial to keep the lysate on ice to prevent the inactivation of the recombinant protein. The lysate was sonicated in an ice-water bath at setting no. 4 of a MSE (London, United Kingdom) sonifier (power high, amplitude 5, 30 seconds pulse, 30 seconds rest for 5 minutes). Bacterial DNA that may be attached to Ehmeth was removed with Benzonase Nuclease (Novagen) treatment (5 U/mL of sonicated lysate), for 30 minutes on ice. The lysis was completed by addition of 300 μL of BugBuster protein extraction reagent (Novagen) for 30 minutes on at 4°C with gentle agitation on an orbital shaker (100 rpm). The recombinant GST-Ehmeth protein was purified under native conditions on a glutathione-agarose resin according to the manufactures instructions (Sigma). For 25 mL of lysate, 500 μL of slurry resin beads were added and incubated at 24°C for 1 hour. The beads were washed twice with lysis buffer (10 volumes of lysis buffer per volume of beads) and 6 times with cold PBS. These extensive wash steps insure that there was no remain of Benzonase before the elution step. Recombinant Ehmeth protein was eluted from the glutathione agarose beads by incubating the beads with 5 mL of glutathione elution buffer (Tris HCl 50 mM pH 8.0, glutathione (Sigma) 10 mM) for 12 hours at 4°C with gentle rotation. The beads were removed by centrifugation (2,000 rpm, 5 minutes) and the supernatant was collected. The elution buffer in the supernatant was replaced by a storage buffer (KCl 200 mM, EDTA 10 mM, 0.1 mM DTT, Glycerol 60% in PBS). For this purpose, 5 mL of supernatant was loaded on the top a Millipore Microcon YM-30 centrifugal filter devices (30 kDa cut off column) and centrifuged at 8,000 rpm for 20 minutes at 4°C. The concentrate protein was diluted in storage buffer (5 mL) and reloaded on the filter device. The same procedure should be repeated at least 3 times to insure complete replacement of the elution buffer by the storage buffer. Finally the concentrated protein should be diluted in approximately 300 μL of storage buffer. 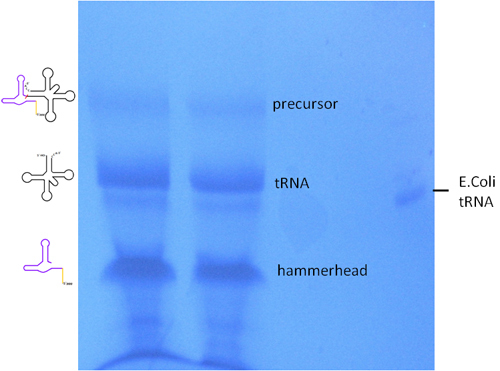 The concentration of the recombinant protein was measured by a Bradford protein assay. The recombinant enzyme preparation was stored at -20°C. Final concentration of the enzyme should not be less than 3 μg/μL as a suitable concentration for the methylation assay. The protein preparation was checked by SDS-PAGE. Notice : to insure the preparation of an active enzyme, all purification steps should be done on ice and DTT should be freshly prepared and added to the storage buffer. This insures an active enzyme for 6 months. 1 M solution of tris(hydroxymethyl)aminomethane. Adjust the pH of the solution to 8.0 with concentrated hydrochloric acid (HCl). 5X Methylation buffer (MB): 100 mM Tris pH 8.0, 100mM NH4OAc, 0.1 mM EDTA, 10 mM MgCl2. The MB can be prepared in advance and stored at -20°C without dithiothreitol (DTT). Prepare the unlabeled S-adenosylmethionine (AdoMet) stock (final concentration 1.5 mM) by mixing 5 μL AdoMet (New England Biolabs, 32 mM concentration) with 101.67 mL of distilled water. Scintillation liquid 3 mL per sample vial. A pipeting scheme is prepared (Table 2) for a 40 μL final volume of methylation assay. 4 μL of DTT was added (concentration of the stock solution) to 8 μL of 5XMB solution. The tRNA solution was incubated at 85°C for 2 minutes and the solution prepared in Step 3 was added immediately to it. The mixture was allowed to cool down at room temperature for 15 minutes to let the tRNA fold correctly. The AdoMet mix (final concentration 200 μM) was prepared by mixing 50 μM of labeled AdoMet (250 μCi, 10.0 Ci/mmol, PerkinElmer) with 150 μM of unlabeled AdoMet. For an AdoMet mix suitable for 10 labeling reactions, we mixed 5.2 μL of unlabeled AdoMet (from the diluted solution), 29 μL of labeled AdoMet and 5.8 μL of distilled water. 4 μL of the AdoMet mix prepared above was added to the tRNA solution and incubated for 2 minutes at 37°C. The tRNA methyltransferase, Ehmeth (1-10 μM final concentration) was added to the solution containing the tRNA substrate and the labeled-unlabeled AdoMet cofactor. The mixture was incubated for 3 hours at 37°C. The tubes were mixed regularly during the time of the incubation by gently flipping them. A kinetic curve of the enzymatic reaction was built by taking every 20 minutes a sample (8 μL) from the reaction mix over a period of three hours. The filter was washed with 100% ethanol on ice for 10 minutes. The filter was air-dried for a minimum of 20 minutes. The radioactivity incorporated in the tRNA was using a scintillation counter (Counter Beta Tri-Carb 2100TR). High values in column A or B (Table 3), the control sample values were similar to those expected from the methylation reaction in Column C or D (Table 3) → the filters were not washed properly. Low values in column C or D (Table 3), the methylation experiments had similar values to the control reaction in column A or B (Table 3) → the enzyme was not prepared correctly, meaning that there was no Adomet incorporation. Another option is that the tRNA was degraded and was not a suitable substrate for the enzyme, this can be checked by running the tRNA sample on a urea acrylamide gel (see 1.2) and staining the gel with ethidium bromide to examine the integrity of the tRNA. Low values in Column D (Table 3) → since the activity of Ehmeth is weaker then hDnmt2 the enzyme performance may be improved by increasing the DTT concentration in the storage buffer (can range between 1 to 10 mM) or to increase the enzyme concentration to palliate the poor quality of the enzyme. Low values in column E (Table 3) → this column represents the total radioactivity of the labeled AdoMet value (referred to as 100%), if the value in this column is low it means that the AdoMet is no longer active and has lost its radioactivity. Table 1: Pipette scheme for PCR and PCR program. Table 2: Example of pipeting scheme. Each column in the scheme represents one sample. * Both Ehmeth and hDnmt2 were fused to a GST tag with an estimated protein size of 62 kDa. A-	Negative control that includes Ehmeth only. B-	Negative control that includes tRNA only. E-	Total value of the AdoMet on the filter. This value is used for the calculation of the percentage of methyl group incorporated. Table 3: Example of values read by the scintillation counter. Each column in the scheme represents one sample from Table 1. Figure 1: (A) T7 transcription template and primers for in vitro transcription. All sequences are written in 5' to 3' orientation. Colorcode: see text. (B) Scheme of product formation during transcription. The RNA transcript is synthesized by T7 RNA polymerase. Hammerhead ribozyme and tRNA fold into their respective 2D-structures and the ribozyme cleaves itself of the tRNA leaving a hydroxyl group at their 5'-end (adapted from 9). Figure 2: PCR reaction control on a 1.3% agarose gel prestained with 1X GelRed. PCR reactions on two different templates are shown alongside a 100 basepairs plus ladder. Controls include a "template only" lane and reactions in which the reverse primer was omitted. Figure 3: UV-shadowing. A PAGE separation of two transcription mixtures is shown. Bands of precursor transcripts (before cleavage), full length tRNA and hammerhead ribozyme become visible as shadows since they prevent UV light from reaching the fluorescent TLC plate. Total tRNA from E. coli is used as size marker. In this presentation, we illustrated how to prepare active components for the measure of the tRNA methyltransferase activity of E. histolytica Ehmeth enzyme. This procedure can serve as a starting point and be easily adapted for the measure of other tRNA methyltransferases. It is important to follow the procedures that preserve the quality and the integrity of the tRNA substrate and of the tRNA methyltransferase protein to insure an optimal measure of the enzymatic activity. This study was supported by grants from the Israel Science Foundation and the Rappaport Family Institute for Research in the Medical Sciences, and the Deutsche Forschungsgemeinschaft (DFG). Banerjee, S., Fisher, O., Lohia, A., Ankri, S. Entamoeba histolytica DNA methyltransferase (Ehmeth) is a nuclear matrix protein that binds EhMRS2, a DNA that includes a scaffold/matrix attachment region (S/MAR). Mol Biochem Parasitol. 139, 91-97 (2005). Fisher, O., Siman-Tov, R., Ankri, S. Characterization of cytosine methylated regions and 5-cytosine DNA methyltransferase (Ehmeth) in the protozoan parasite Entamoeba histolytica. Nucleic Acids Res. 32, 287-297 (2004). Harony, H., Bernes, S., Siman-Tov, R., Ankri, S. DNA methylation and targeting of LINE retrotransposons in Entamoeba histolytica and Entamoeba invadens. Mol Biochem Parasitol. 147, 55-63 (2006). Kuhlmann, M. Silencing of retrotransposons in Dictyostelium by DNA methylation and RNAi. Nucleic Acids Res. 33, 6405-6417 (2005). Katoh, M. Developmentally regulated DNA methylation in Dictyostelium discoideum. Eukaryot Cell. 5, 18-25 (2006). Phalke, S. Retrotransposon silencing and telomere integrity in somatic cells of Drosophila depends on the cytosine-5 methyltransferase DNMT2. Nat Genet. 41, 696-702 (2009). Tovy, A., Siman Tov, R., Gaentzsch, R., Helm, M., Ankri, S. A new nuclear function of the Entamoeba histolytica glycolytic enzyme enolase: the metabolic regulation of cytosine-5 methyltransferase 2 (Dnmt2) activity. PLoS Pathog. 6, e1000775-e1000775 (2010). Jeltsch, A., Nellen, W., Lyko, F. Two substrates are better than one: dual specificities for Dnmt2 methyltransferases. Trends Biochem Sci. 31, 306-308 (2006). Fechter, P., Rudinger, J., Giege, R., Theobald-Dietrich, A. Ribozyme processed tRNA transcripts with unfriendly internal promoter for T7 RNA polymerase: production and activity. FEBS Lett. 436, 99-103 (1998). Hermann, A., Schmitt, S., Jeltsch, A. The human Dnmt2 has residual DNA-(Cytosine-C5)-methyltransferase activity. J Biol Chem. 278, 31717-31721 (2003). Narsa Reddy, M., Tang, L. Y., Lee, T. L., &, T. L., James Shen, C. K. A candidate gene for Drosophila genome methylation. Oncogene. 22, 6301-6303 (2003).